ICICI Prudential Mutual Fund is offering an optional feature under its ICICI SIP Plus Plan to the investors aged above 18 years and not more than 51 years, at the time of the first investment. The cover of ICICI SIP Plus amounts to Rs 50 Lakh for the investors who invest with MySIPonline keeping a minimum SIP of Rs 1,000. The scheme value plus life cover will be equivalent up to 10 times of the monthly SIP Plus instalments in the first year, 50 times of monthly SIP Plus instalment for the second year and 100 times of the monthly SIP Plus instalment from third year onwards. ABSL Tax Relief 96 Fund is ranked as best tax saver fund generting 24.15% Returns in past 5 years. ICICI Prudential Asset Management Company has been working well to provide the best to its investors. It has been focused towards updating and innovating the methods to help investors achieve their financial goals in the best possible way. One such step came forward in the form of ICICI insurance named SIP Plus. In the coming article, you will get to read about what it is and the conditions and benefits that comes with it. SIP Plus is a life insurance cover that is provided to the investors that invests in ICICI Mutual Funds designated schemes through SIP. It is a systematic investment procedure that helps an investor invest in a disciplined manner to earn attractive returns on the money invested along with life cover. It can be said that it a convenient, simple, and disciplined way that will help a person meet the changing responsibilities and milestones with time. The minimum investment amount in this will depend on the scheme that you are investing in. The scheme’s minimum investment amount is what you will have pay. What Is the Sum Insured in ICICI Insurance Plans? The sum insured for the first year will be 10 times the monthly installment. In case of second year, this amount will be 50 times and in three years, it will be 100 times the installment. Please note that the maximum cover under this plan is Rs. 50,00,000 lacs per investor. What Is the Age Requirement in ICICI SIP Insurance Plus? Any person whose age is more than 18 years and less than 51 years is eligible to invest in this plan. The insurance cover will cease automatically on completion of 55 years of age. However, the SIP will be continue till the end of investment tenure. What Are the Loads Payable in ICICI SIP Insure? There is no entry load which is payable by an investor here. The exit charges will be the same as that in the scheme in which the investment is being made. The payments under icici insurance plan can be made either through ECS, Direct Debit or post dated cheques. This group insurance cover will not be for anyone whose death happens due to suicide in the first year of investment. It will not cover the person who dies within 45 days from the date of commencement of SIP. Please note that it does not involve the deaths that have occurred due to accident. Any investor who discontinues the investment in SIP before completion of three years will no more be eligible to avail the cover benefits. Installments not paid for a continuous period of 5 months will disable the life cover. The cost of insurance will be borne by the asset management company itself, and therefore it is absolutely free for the investors. If there are many holders, only the primary holder will be eligible for cover. It should be noted that the insurance claim by the nominee should be made directly to the insurance company and not to the asset management company. The application for group insurance by an investor will be rejected if he/she is not eligible for the same. 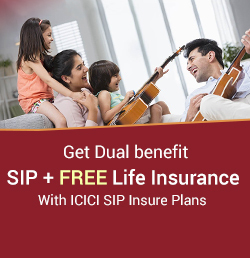 You may invest in the plans with SIP Plus of ICICI Mutual Fund attached to it in order to avail the benefits of SIP investment along with the free insurance cover. The investment for long-term will help investors earn better returns with time as a result of rupee-cost averaging along with the compounding benefit. An investor investing in these plans won’t have to time the market. You may invest in the schemes via MySIPonline, which has a simple and time-saving investment procedure. For any help or assistance, feel free to connect with the experts on the same platform.